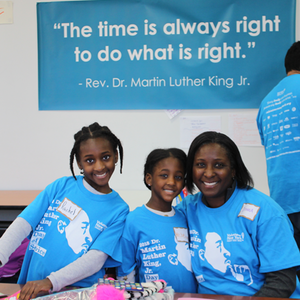 Join your community in action for the 2019 Dr. Martin Luther King, Jr. Day of Service on Saturday, January 19. Register for a volunteer opportunity in New Rochelle, Elmsford, or Rockland to help to empower individuals, strengthen communities, bridge barriers, create solutions to social problems and support local nonprofits. This year on #MLKDAY you can help honor the legacy of Rev. Dr. Martin Luther King, Jr. Many opportunities are family-friendly and are great for the whole family to get involved. Together we can help fulfill Dr. King’s dream of building a "beloved community." The annual MLK National Day of Service is a day supported by the Corporation for National and Community Service to empower individuals, strengthen communities, bridge barriers, create solutions to social problems and support local nonprofits.